A crossover to review a crossover! AWESOME REVIEW!!! Thxs TJ and you too shades for the EPIC review! 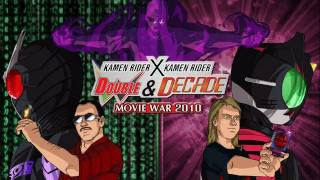 I can see you both put alot of effort in to this so i thank you both and keep up the good work!Oh and DECADE RULES!!!! did anyone notice at time stamp 6:58 that Philips's name appears for a few seconds? Soo... being a total noob to Kamen Rider, just a question... The other Riders bring back Decade to life, the guy who just... KILLED everyone else? To 'preserve their memory'? To me, the guy sounds as crazy as the editors from FAQ about Time Travel, who kill artists and famous people before they pass their prime. Why would anyone bring a guy like that back to life? ... what the f*** was THAT?!?!? Well, I was curious about Kamen Rider, but that's just scary! Where would I start?!?!? I haven't seen Decade yet, watchin' OOO (episode 18). Is Decade's hair always like that in the show? Since when does Decade use Diend's Final attack ride. One thing to note about the Dummy dopant; while it appears in this crossover movie, its actual effects are elaborated on in one of the Kamen Rider W/Double net movies...for A-Z Gaia Memories. I only found it by accident myself. Apparently, it's able to sense the thoughts of others...or something like that. decade's hair gets even CRAZIER in the kamen rider X super sentai movie!!! I feel bad because I can somewhat rationalize everything these two can't.